Order the book using this flyer and get a 30% discount. Sergei Parajanov (1924–1990) flouted the rules of both filmmaking and society in the Soviet Union and paid a heavy personal price. An ethnic Armenian in the multicultural atmosphere of Tbilisi, Georgia, he was one of the most innovative directors of postwar Soviet cinema. Parajanov succeeded in creating a small but marvelous body of work whose style embraces such diverse influences as folk art, medieval miniature painting, early cinema, Russian and European art films, surrealism, and Armenian, Georgian, and Ukrainian cultural motifs. The Cinema of Sergei Parajanov is the first English-language book on the director’s films and the most comprehensive study of his work. James Steffen provides a detailed overview of Parajanov’s artistic career: his identity as an Armenian in Georgia and its impact on his aesthetics; his early films in Ukraine; his international breakthrough in 1964 with Shadows of Forgotten Ancestors; his challenging 1969 masterpiece, The Color of Pomegranates, which was reedited against his wishes; his unrealized projects in the 1970s; and his eventual return to international prominence in the mid-to-late 1980s with The Legend of the Surami Fortress and Ashik-Kerib. 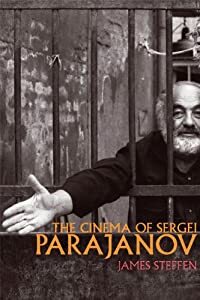 Steffen also provides a rare, behind-the-scenes view of the Soviet film censorship process and tells the dramatic story of Parajanov’s conflicts with the authorities, culminating in his 1973–77 arrest and imprisonment on charges related to homosexuality. Ultimately, the figure of Parajanov offers a fascinating case study in the complicated dynamics of power, nationality, politics, ethnicity, and culture in the republics of the former Soviet Union. A Mellon Slavic Studies Initiative Book. This book is part of an initiative for publishing first books by scholars in the fields of Russian, East European, and Central Asian Studies, supported by the Andrew W. Mellon Foundation. Available from the University of Wisconsin Press; E-book version also available from the publisher. Also available from Amazon or Barnes & Noble. “[A] book to celebrate. […] Steffen’s research draws extensively on holdings in state archives and in the Parajanov museum, and it will offer future scholars many new leads. […] He has filled in countless gaps in our knowledge, particularly in his fine reconstruction of the film Kyiv Frescoes (1965-66), on which production was stopped, and his superb account of the censorship history of The Color of Pomegranates. […] [W]e can be very grateful for this generous, intelligent and deeply responsible book.” Stephanie Sandler, The Russian Review. Paley, Toney. “The Colour of Pomegranates: a chance to savour a poetic masterpiece.” The Guardian. October 7, 2014.